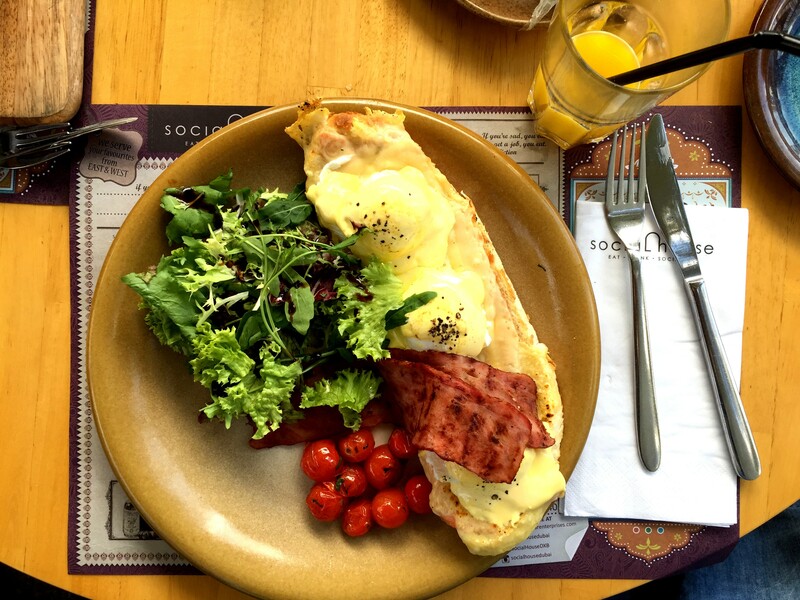 To all 'Eggs Benedict' addicts: Social House Dubai serves up 3 of them for breakfast! The Social House has been reopened for two months now. I’d hadn’t been here before its re-styling but I really liked the restaurant concept, it is lovely. 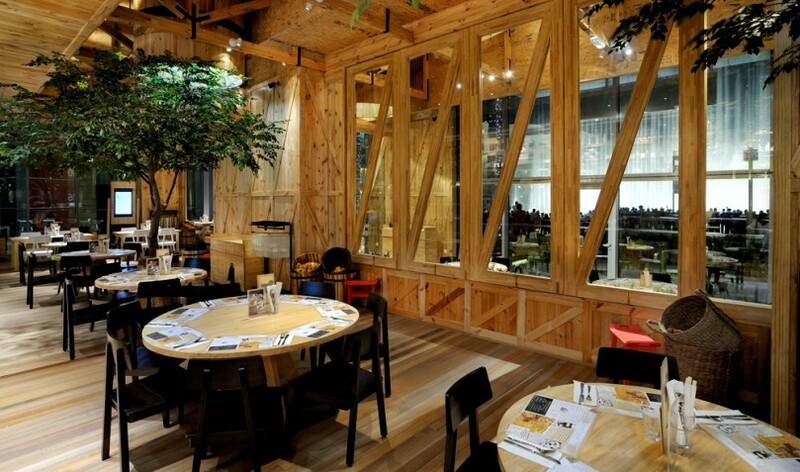 The atmosphere is informal and very cosy. The restaurant space is huge (12,000 sq. ft!) and it has different areas: you can eat under big trees which are inside, in a VIP Private Room – ideal for your special dinner/lunch party – or eat on its terrace, enjoying the food with the beautiful view of the Burj Khalifa and the Dubai fountain. 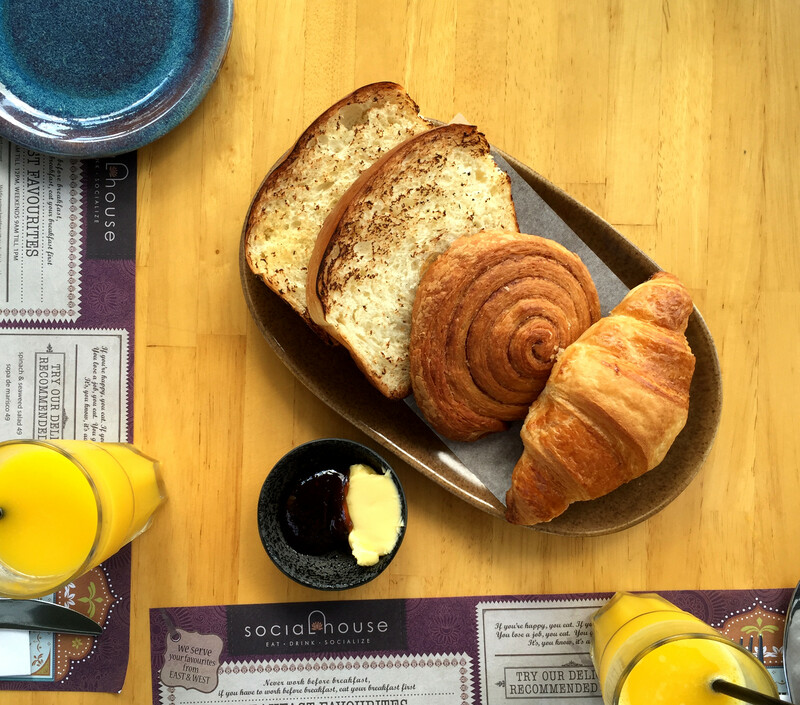 I went to the Social House with a friend of mine for our Friday breakfast. It was a lovely sunny day so we sat on the terrace. Its breakfast menu has many varied options: you can choose from different dishes inspired by culinary traditions around the world, from Japan to Italy! 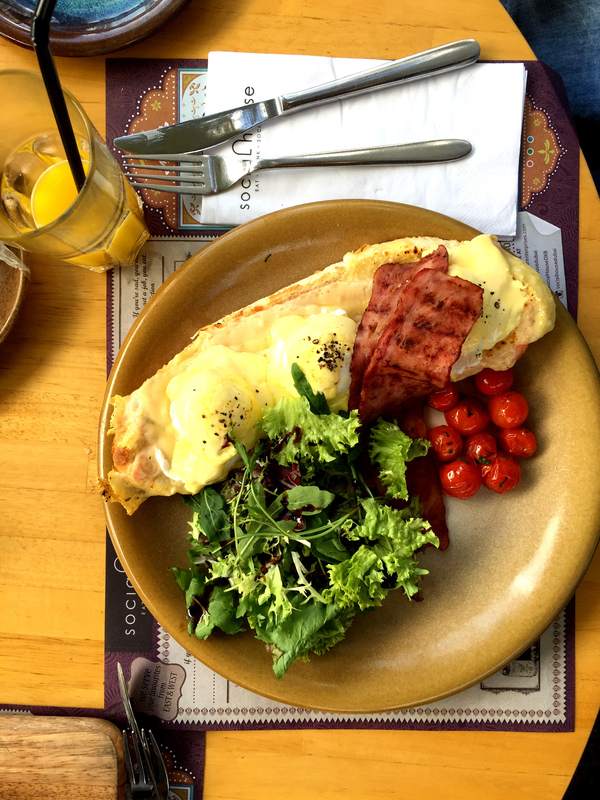 I ordered eggs benedict with smoked salmon: served on a butter roasted rustic bread, melted emmental and with natural cooked ham on the side – an orange juice and an espresso. The eggs dish was very good, I loved it, but far too much for my stomach: there were 3 of them! – So if you like big portions this is the place for you, although they were delicious, I ate only two – I didn’t like the natural cooked ham and even the espresso was definitely bad. The orange juice was ok.
My friend ordered Messy Sally: grilled cheese sandwich, natural cooked ham, gruyere, truffled hollandaise, mushroom, heirloom tomatoes and rocket. I have not tried it but looks yummy, what do you think? As well as these dishes we also requested a basket with bread, brioche and croissant served with butter and jam on the side – we both like to finish our breakfast with something sweet. Unfortunately, the bread was nothing to write home about, the brioche was quite tough and the jam was rather tasteless. The staff were very kind but the service was slow. The cost of this breakfast is 224.00 AED [around 56,00 €], and this included two Orange juice and two coffees. 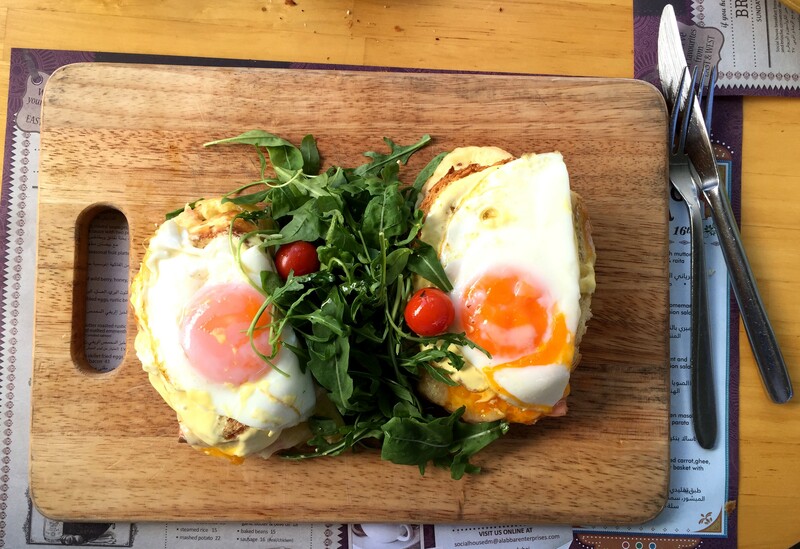 Click here to find the place which serves excellent eggs benedict in Jumeirah Beach Residence (JBR-Dubai)! Breakfast: Sunday – Thursday 9am to 12 noon / Weekends 9am to 1pm.